I live in Southern California where we can cycle year round. Although I work a full time job 8 to 5 during the week, I feel a weekend is not really a weekend without a bike ride in it. My parents belong to a cycling club in the late 60’s and my husband’s parents belong to a cycling club in the mid 70’s. I grew up being taught that a bicycle is not a toy but a mode of transportation. One of my husband’s and my first dates was on a bicycle to a picnic in the park. In the early 80’s we were trying to find a form of exercise we could do together and we found cycling was something we stuck with. We joined the Orange County Wheelmen in about 1985 and it became our social life. We’ve been members ever since and our children were raised as part of the club. The oldest was riding in a trailer behind our tandem at 5 weeks old and the 2nd one at 2 weeks old. By the time they were 4 they were on the back of our tandems and we did many rides as a family with two tandems until the girls were into their late elementary school years. In the early 90’s we did our club’s annual Amtrak century by riding the first half on our singles and picking up our girls and tandems at the lunch stop handed off from our parents and rode the 2nd half with the girls. Cycling is social and it’s an activity that people with different strengths or skill can do together. My husband and I found we could exercise together and spend time together easily. We never “dreaded” going for a ride. I did a few cycling time trials and club races in the early days, but most of my cycling events have been century rides. I was an active Cat 3 USCF road official (usually chief judge) for a period of 7 years and did it to support the sport. Promoters loved hiring my husband and I because they could get two experienced officials and only have to pay fuel costs for one and we worked so well together. My husband and I were high school swimmers, and in 2011 we both needed to do a lot of work travel so we started running because we could keep up our conditioning while traveling. So the obvious next step was tackling a triathlon. We have competed a couple of years doing sprint distance and finished up this year with our first Olympic distance and have a half on the schedule for next year. However, I don’t consider myself really a triathlete, I think of myself as a road cyclist who does tris. If it’s a bike, I enjoy it. Most of my miles are on road, but I love my mountain bike and have done some touring in New Zealand and France on hybrids on gravel. We were avid road cyclists for several years and when mountain bikes first came out in the late 80’s, I remember getting my first mountain bike and being so excited like a kid again. How nice it was to not have to feel like you have to kit up to ride and being able to ride on dirt and up and over curbs. That first night I took my mountain bike into my bedroom and parked it next to my bed so I would wake up next to it in the morning. Have you had a bike accident or a situation that was challenging? If so, how did you recover on a physical/mental/emotional level? Hmmm… the closest I’ve had are friends that have crashed, and it does get me thinking, what if. I’m a firm believer that the more miles your ride and experience on the bike will help you handle tricky situations. The more miles I have in a season, I find it easier it is to do the more technical mountain trails. You no longer have to steer but your mind just tells the bike where to go. I am a very fast descender, but I trust my bike and become part of the bike on the descent. I always try to keep my bikes in top condition to avoid issues. Probably the toughest physical/mental/emotional challenge I had was the Ride around the Bear Century in Southern California - 100 miles with over 9000 feet of elevation. I had a great group of friends to train with but I knew I was a slow climber and knew it was going to take a lot of hours to complete the ride. But I made a plan to have a friend personal sag me after the cut off and just kept moving. I did overheat and dehydrate at one point, but was able to get some cold fluid in me and finish strong (great downhill). 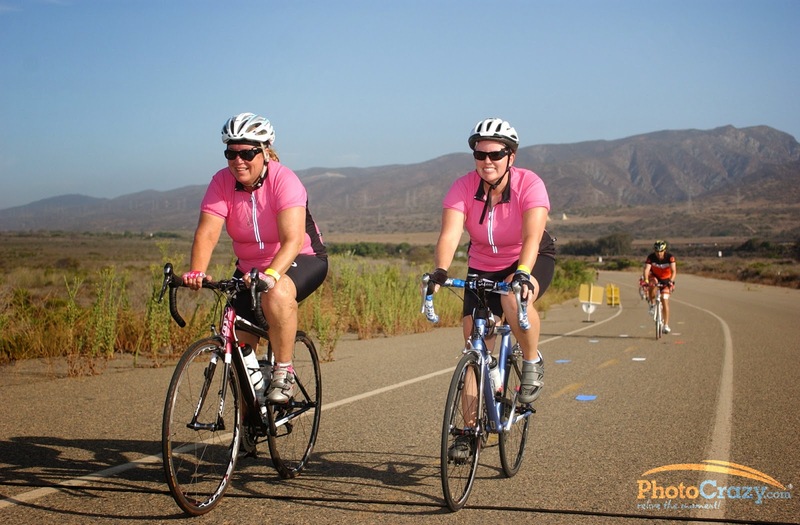 You are involved with Team Tough Chik, how did you hear about the team and why did you join? We had cut back on the riding when our girls were in their high school years, but when we decided to get back involved on a more frequent basis, I noticed that there were no longer the couples and women in our bicycle club and it had turned into a bunch of old men. I decided right then I needed to help get women riding. I knew that if I drove home after work it was going to be too easy to not get back out of the house to get my rides in, so I planned rides after work close to my work. One of my girlfriends from work wanted to join and other women asked about it and before I knew it I was mentoring a group of beginning women cyclists who had never really done an exercise program before. These women were very nervous riding and most of them started on mountain bikes or hybrids. We started on the bicycle trails through Irvine in the middle of March and by the end of summer they were riding on the streets and increasing in distance. Most of them had transitioned to road bikes. We had fun on our rides, sometimes stopping for Frozen Yogurt and celebrating with a champagne toast for any of the women that got a new bike. That first year three of us did the club Amtrak century. The 2nd year I trained a group of 5 beginning women to complete the century and the next year I helped another OCW club member doing a series of Saturday rides for women to train them for the century. That year we had 27 women join the club. Many of these Saturday riders also started attending my Monday/Wednesday evening rides to get in their miles. My husband has been supportive of our group since day one and we consider him our personal Rico Sauvé. During this time I was Google searching for cute clothing that featured cycling and stumbled across the Tough Chik web site. I read about the team mission and knew it was the team for me and will be starting my 4th year as a team member. I’ve met many women across the US and the love the camaraderie and support the team members provide each other. In April 2014, Team Tough Chik did So Cal Ragnar and we had team members come from Canada, Chicago, New York, Texas as well as our California girls. Imagine 12 women stuck in a van together for 30 hours that had never met in person before. This was a true example of the TTC mission come to life. Why has being involved with a group been beneficial for you? Whether it’s the OCW club, my Chicks that Ride group, or Team Tough Chik, being involved with a group makes it social. You have people that like to do similar things out together exercising. So many of the cycling race teams are about elite and podium wins that a person like me would not fit in. The groups I’m involved in welcome all levels of riders and seek to encourage one another instead of just breeding competitiveness. Also when you make a plan to go on a ride with someone, it keeps you accountable to show up so you can continue to work on your goals. I love that it’s an activity I can do with my husband and we can talk and experience things together. I’ve often told people that since I’ve joined the OCW, I’ve seen more of Orange County on my bike that I ever will see from a car. Riding makes me smile and I’ve met a lot of friends through cycling. I taught swimming for many years and teaching adults was the most rewarding because of how excited they were when they got over their fear of the water. Mentoring women cyclists is similar experience because they realize no matter what shape they are in, they can become an athlete and be successful and enjoy a physical activity. Accomplishing these kinds of goals helps them be successful in other areas of their life. My favorite part of my ride is who I share it with. I’m really good at getting children to learn to ride a bike. (Or coaching parents on how to teach them). Well….you’ve heard of the theory of N+1? When we first started seriously road riding I borrowed my mother-in-law’s road bike. My husband wasn’t sure I would stick to it and didn’t want to invest in a good bike for me until he was sure. When one Saturday, he really didn’t feel like riding and I said I was going anyway, he decided it was time and bought me (with his annual bonus that year) a professional Italian Steel Faggin frame and had it built up with Campy components. There were no women’s specific frames back then and I bought the smallest road frame they made. Supposedly this was the bike that the Italian Olympic team rode in the 1984 Olympics. I loved that bike and still have it and will bring it out for Vintage road rides. I rode many centuries on that bike for over 20 plus years. We had several tandems during the middle years that we rode together and with our children. Then when we started riding seriously again in about 2007, I realized it was time to get modern and bought a used WSD Trek aluminum bike and switched to Shimano components (still feels weird). Less than a year later, my grown daughter decided she wanted to join my women’s group and train for a century so I bought another used bike, a year old Carbon Fiber (metallic pink & black) Felt ZW2 with Dura Ace. It was in immaculate condition. My husband converted it to Ultegra DI2 electronic shifting and it continues to be my race bike. Every time I get back from a ride, I tell my husband, “I love my bike”. Just picking it up to load it in the car makes me smile. That year my daughter and I rode the Amtrak century together. This year Diamond Back sponsored Team Tough Chik and I was able to get a pro bike deal on an Arien 5 with DI2. This is more of an endurance frame and I use it for century rides and longer training. It has a larger gear for better climbing than my Felt. I also have a Raliegh Eva 29’er mountain bike. It’s my 4th mountain bike but I’ve given away all the others now – had to make room in the garage. I consider these my “play” bikes and love that they can get me really out in nature. I also have my "city bike" a 3 speed mixte frame with panniers and a basket. I use it for ALL my errands within 7 miles if home. Giant Via. Love it! We live close to two malls and never have to worry about parking. Hubby complains because when we go on a camping trip I always want to take two bikes, one for errands and the other for fitness (either mountain or road). I love my Garmin 500. When I started cycling we had wired computers which only really kept track of miles. With my Garmin I can track everything and analyze the heck out of it on Strava if I want. I would recommend women invest in a really good chamois and find a saddle that really works for you. I have a Selle Italia Diva on all my road bikes. I never have an issue and can go for miles. I rode on a man’s narrow race saddle for years and it’s really true, you do NOT need a wide saddle to be comfortable. I think women are intimidated by the male dominated sport and men just don’t take women seriously. I once asked my husband if he thought men would think it’s silly that my bike is pink, and his reply was, “Not once they see how you ride it, they will be impressed and it doesn’t matter what color the bike is.” Of course I learned to ride fast and hard with the men in the early days and that muscle memory comes back pretty easily. But by having a group of women to ride with can be encouraging and make it easier to get out and just ride. I believe there is a current movement by the industry that is making changes and recognizing this group of consumers. Continuing to mentor and educate women will only help to change the next generation of women to not even think of it as a man’s sport. I’ve never thought of it as a gender specific sport and I hope that we can continue to set examples so that women are no longer intimidated. Working with women who never thought they could ride “that” far and each week do their longest ride ever. Watching them get stronger and being able to climb the whole hill without stopping. Watching them training and finishing a century but not have that be the final event. Having them come back out in the weeks after the century and continue to ride. These all inspire me to keep encouraging new riders.